1. Biden probably will not give up his bid to be re-elected to the United States Senate. The question, of course, is how committed are you to being the Vice-President if you are hedging your bets. (1) It's pretty much standard operating procedure for senators who are vice presidential candidates to remain on the ballots for re-election to the senate while campaigning for the higher office. Lyndon Johnson did it in 1960, as I recall. Hedging bets? Yeah, maybe. So what? (2) It'll be interesting for the McCain camp to try to argue that Biden's tenure in Washington--thirty-six years--means he can't bring change to the government. McCain, by my reckoning, has been there for twenty-six years, hardly making him a babe in the Washington woods. 1. He doesn't moderate Obama politically. Biden is a conventional liberal pol. Obama, I think, needed to pick more of a centrist to broaden his appeal and to reassure moderates and conservatives who want to boot the GOP out of the White House this year that he isn't too liberal. 2. He doesn't help Obama get a state he wouldn't otherwise get or help him in a region where he isn't otherwise competitive, namely the South. 3. It's not clear, for all of his experience with foreign policy and national security, that Biden helps Obama in those areas with the electorate. In governing, Biden's experience would help Obama mightily, no doubt. But the public has little or no perception of Biden in these areas. 4. Finally, it must be said that while Biden displayed great discipline throughout most of his campaign for the nomination, he is still prone to gaffes. (To be fair, I imagine that I would be too, if I were in the white hot spotlight of national politics.) Though Biden is a refreshing straight-talker, his penchant for shooting from the hip must concern the Obama camp. During the pre-convention process, I thought that Joe Biden was not only, along with Bill Richardson, one of the two most credentialed of the candidates in the Democratic presidential field, but also the most impressive campaigner. His performances in the debates were sterling. A Biden-Obama ticket would have been far more potent, I think, at least in terms of governance after January 20, 2009. Overall though, Obama has given us an important window onto his thinking as well as his self-esteem. The guy willingly chose, irrespective of the red flags mentioned above, the best possible running mate in his party. That's impressive. The Biden selection also is a challenge to John McCain. With Obama having picked someone as obviously prepared to be president as Biden, McCain will have to choose someone of equal gravitas. He cannot make a flippant political choice. Already, owing to what I think are unfair and inappropriate concerns about McCain’s age, the GOP candidate had to have been feeling pressure to pick someone obviously prepared to be president. Now, those pressures will be intensified. That, to my mind, leaves out people like Mitt Romney and Tim Pawlenty, two swell fellows both lacking in gravitas or the chops to face off with Biden in debate. McCain cannot slip up here. The mother of blogging colleague Andy Jackson has passed away. She died at noon Pacific Time today, as church bells rang and Andy read Psalm 23 to her. Please pray that God will sustain and strengthen Andy and his entire family in the certain hope of resurrection which belongs to all who trust in Jesus Christ. O God, with all your faithful followers of every age, we praise you, the rock of our life. Be our strong foundation and form us into the body of your Son, that we may gladly minister to all the world, through Jesus Christ, our Savior and Lord. Confession of faith in Jesus Christ, God in the flesh, is the foundation on which Christ builds God's eternal community, the Church. The Church is essential for Christian faith...no Church, no faith. The Church is composed of those willing to stand under Christ even as we fail to fully understand Christ; we follow by faith. Faith, simply, is trust in God that God creates in those who are willing to believe. If that's clear as mud, let me offer a few words on the lessons. 2. Isaiah 51:1-6: Most modern scholars believe that Isaiah 40-55 were written by a prophet from the Isaiah school of teaching during the Babylonian exile. Many Old Testament passages give voice to the anguish felt by God's people. But it was also in this time period that many were inspired by God to hope for the coming of a new anointed king, Messiah, who would put things right. The exile happened in the 6th.-century BC. The two paragraphs in this pericope, vv. 1-3 and 4-6, both begin with the word "Listen" and are followed by warm promises of God. The faithful audience is characterized as those who pursue righteousness and who seek Yahweh. Israel's ancestors Abraham and Sarah are compared to a rock or a quarry, something solid in a time of great uncertainty. The gospel for the date, Matt 16:13-20 has the famous saying about Peter, You are the rock and on this rock I will build my church." Though they were originally one (or two if you want to be picky about it), they became under God's blessing a numerous people. Similarly the exiles, few in number, could look forward to a God-blessed population increase. "Comfort" is a theme word in Second Isaiah, beginning with 40:1. Comfort means much more than sympathy; it means God-worked transformation. Zion's waste places and wilderness will become luxuriant like the Garden of Eden. The transformation will be marked by appropriate human rejoicing: joy, gladness, thanksgiving, and singing (v. 3). The second paragraph, vv. 4-6, is written in the first person as the words of Yahweh. God's teaching that goes forth and God's justice recall the eschatological promise of Isa 2:2-5. Verse 5 promises God's speedy intervention as a military liberator. Note the military images in Yahweh's arms/arm. The nations too will rejoice in this deliverance. Heaven and earth as we know them will vanish and wear out, while Yahweh's salvation and deliverance will last forever (cf. Isa 40:8, which states that grass withers and flowers fade, but that Yahweh's word or promise will stand forever). 4. Psalm 138: This hymn of praise, ascribed to David, expresses thanks to the God who preserves His people "against the wrath" of their enemies. 5. Romans 12:1-8: The opening verses of this passage are extraordinary! In it, God tells us to offer Him our bodies, which is acceptable spiritual worship. Once God has access to out bodies and our spirits, God will begin to transform our minds, beginning, as in the case of Peter in this Sunday's Gospel lesson, by creating faith. The reason I find vv. 1-2 so extraordinary is that they convey a truth: Give your body over to something or someone and your mind and spirit have no choice but to follow. Don't believe me? Consider some examples. Two people think that they might like to be friends, but are uncertain. Until they take the time to meet and talk--even if that meeting and talking take place in cyberspace, they won't be friends. No commitment will happen. Or, in a negative vain, consider an addict. The addiction may be alcohol or drugs, whatever. If the person can physically avoid ingesting, inhaling, or exposure to the object of addiction, the mind and the spirit will become habituated away from the addiction. This applies to faith as well. As this Romans passage reminds us, faith happens and grows in the Christian community of which each member is an irreplaceable part, the Church. We may come to worship feeling skeptical, indifferent, or rebellious, for example. But if we willing submit our bodies to the discipline of regular worship, it's likely that God can work on our spirits and minds to build faith. We are wholistic beings--bodies, minds, spirits. Wherever we commit to take our bodies, our whole selves will follow. This is why those who stop worshiping regularly are in jeopardy. Just as our whole selves will wither and die if we don't show up for meals, our whole selves will wither and die if we aren't regularly in worship with the Body of Christ, the Church. As Rick Warren noted in his book, The Purpose Driven Life: "The problem with a living sacrifice is that it can crawl off the altar." Warren also notes that people who tell us that they won't be somewhere--be it a party, concert, family gathering, or worship service--"in spirit," are telling us one simple thing: "I won't be there." But when we show up bodily, we are there. Knock on the door of the house where the party is happening at the designated time and you'll be at the party. Hand over your ticket to the teller and walk into the arena and you'll be at the concert. Put your backside in the pew of a faithful Christian community on a Sunday morning and you're bound to hear the faith-inciting Word of God. Offering our bodies to God can be as simple as showing up to help with a community service project, making it to a Bible study or prayer gathering. Offering our bodies to God means being there where God sends us. For a brief discussion of Romans 12:1-8, go here. 6. Vv. 3-8 of the Romans passage deals with how believers in Christ are part of a single living organism, the Body of Christ. Each is gifted for service which builds up the whole Church and empowers the Church to fulfill its mission. For a survey of the spiritual gifts, see my series of Advent devotions from several years ago, links to all installments of which can be found here. 7. Matthew 16:13-20: As I've written many times before, context is important to appreciate for understanding a given passage of Scripture. Many scholars think that the Gospel of Matthew's structure is patterned after the Torah, the first five books of the Old Testament, always deemed by the ancient rabbis as the most important portion of the Scriptures. In this theory, which seems plausible to me the Gospel has five thematic sections, each built around a major speech. Have people been able to discern from Jesus' ministry that he is God's Christ, the one anointed to manifest God's salvation and empire (cf. 11:2-6)? 8. Consider another context. The first person to fully and freely confess Jesus as the Messiah in this Gospel is a foreign woman, who appeared in last Sunday's Gospel lesson. Note that this woman's discernment of Jesus as God's Christ happens also in the theorized "third book" of Matthew's Gospel. Within Matthew's narrative, the woman stands out because, by the time she makes her appearance, Jesus' fellow Jews--Pharisees, Saducees, and even disciples--still don't get Jesus. She does. She shows up after a confrontation Jesus has with both Pharisees and Saducees and shortly after the disciples, show, in Jesus' words "little faith" (contrasting with her "great faith") during a storm on the Sea of Galilee. Our Gospel lesson finds Jesus and the disciples in a city known for its worship of foreign gods. Caesarea Philippi was originally a center of Baal worship, then of Pan worship. In Jesus' day, one of the Herods, Phillip, had named the place for both himself and the Roman emperor, who was also the object of idolatry. 9. Yet another context. Immediately following our Gospel lesson, Jesus has to upbraid Peter, the very one whose faith He applauds in this Sunday's Gospel lesson. Why? Because Peter refuses to accept that Jesus must be crucified. He calls Peter, "Satan," surely an indication that neither Peter or the Church is perfect. The Church is Christ's fellowship of recovering sinners. ...but former Cleveland Mayor Mike White says that he and the Congresswoman tragically felled by a brain aneurysm earlier this week remained friends. WKYC talked with White on his alpaca farm. I had an acquaintance with White back when we were students at Ohio State, something I talk about here. Even as a twenty-one year old, White was not just ambitious, but also capable, smart, and confident in interacting with people of all ages. He had political success written all over him. I envied him, to tell you the truth. When the ardent Democrat White was selected by the Republican mayor of Columbus--Tom Moody--to run an urban homesteading program, I wasn't surprised. He was too capable for a little thing like party labels to impede the mayor from bringing him into the city administration. Nor was I surprised that, after returning to his native Cleveland, White was elected to the State Senate and subsequently, to the office of Mayor. I was surprised that he was nearly indicted and that his once seemingly inevitable political progress ended. Life can take unexpected turns and none of us can predict what will happen tomorrow. But the WKYC interview with White held more surprises about this guy I knew thirty-six years ago. The first was Mike White, alpaca farmer. I never could have seen that coming. The other is the apparent forgiveness and grace which he and Tubbs Jones bore for one another, likely a tribute to the characters of each. Character is the thing that endures after a career has ended, meaning that it's vastly more important than a career. And it's one of the things that has the most impact on the living even after we leave this life. "The idea that the universe has no origin is a counterintuitive faith assumption"
"Is it inconsistent, as Richard Dawkins claims, for believers in God to look for scientific explanations of natural things, if they don’t think it is necessary to seek scientific proof of God’s existence?" A good answer. Pastor, author, and blogging colleague Andrew Jackson and his family are experiencing a painfully difficult time. His mother, Ailene, recently underwent major surgery. Complications developed and while she briefly rallied, the prognosis now is not good. I am in Seattle now staying at Virginia-Mason hospital with my mother fighting the last great enemy, death. I stand firm in the God of life and resurrection, and in his sovereign will. I read the Psalms over her. This morning (Thursday), however, we were informed that she has developed an infection which is causing some setbacks. Her heart seems to be working well, but the infection is creating serious concern. They are attempting to locate the infection and they are attempting to fight it with antibiotics. The fight for life goes on. Thank you so much for your care and kind support. I will be staying with my mother - the angel of my life - and I will provide updates when it is appropriate. Please pray for Ailene, Andy, and their entire family, asking God to give His healing, strength, and encouragement, whatever that may entail in God's good will. Because the US allegedly put the Georgians up to the aforementioned "invasion"
Russia presents itself as a champion of Ossetian self-determination. That's absurd. Russia has brutally repressed separatist movements inside its territory, particularly in Chechnya, where Russian artillery and bombs have killed untold thousands of civilians. This is an important point. A recent poll in the US says that a frightening percentage of Americans think that it's okay for a portion of our country to secede any time it wants. An even higher percentage of younger Americans believe secession is fine. This sentiment overlooks a fundamental assertion of the Founders, one that was underscored by our own Civil War: Secession or independence can only be legitimate when rooted in moral imperatives. The two troublesome provinces in Georgia may want independence. But it appears that the desire has nothing to do with moral principles. That is one more factor which, for Americans conversant with their history anyway, should further delegitimize Russia's invasion of Georgia. Putin has been clear about wanting to restore the Kremlin's former empire, calling the Soviet breakup the "greatest geopolitical tragedy of the 20th century." Given what has happened to Georgia, other former Soviet Republics now have good reason to worry. Putin has threatened to target Russia's nuclear weapons against Ukraine if that country continues efforts to join NATO (and a Russian general just warned that Poland could face attack over a missile-defense deal with Washington). So it doesn't matter who "started" the crisis in Georgia. It has little to do with Ossetian rights and everything to do with Putin's drive to restore Russian power. Had Saakashvili not sent troops into Ossetia, Russia would have found another excuse to attack. Rubin, I think, is right to say that the next US president will have to evolve a common policy with the Europeans for dealing with the Russian government's desire to keep its neighbors--and others--under its thumb. 1. Given the enormous challenges represented by the repressive regimes in both Russia and China, the next president will have to make international cooperation a top priority. This doesn't mean ceding US sovereignty, but ensuring its continuation. 2. The US has dithered on this point for thirty years, but it is essential that we develop our own energy sources. There appears to be an increasing consensus, even in this contentious election year, that we must develop multiple energy sources and they must be of the domestic variety. The US can ill-afford to allow itself to be raked over an energy barrel. With the rise of the BRIC nations--Brazil, Russia, India, and China, there will be increased competition for world oil and gas resources. Two of those countries can, I think, be classified as hostile competitors. (Note: I did not describe them as enemies.) In the real world of the twenty-first century, the US must engage these powers, but understand that we cannot look into the eyes of their leaders and detect benign democrats. We must ensure energy self-sufficiency. 3. Reports of the demise of the state in deference to a globalized world in which organizations and corporations that cross national lines play the supreme role are greatly exaggerated. Richard Branson's Virgin brand may, for example, undertake space flight, taking on benign functions previously associated with governments. And the evil of terrorism may be directed by a wealthy person like Osama bin Laden. But governments, with their power (and responsibility) to tax, are the entities that have the greatest ability to help their people or project power in a way that endangers and enslaves their own nation and other peoples. US foreign policy must not forget that we still live in world in which governments wield great influence in human affairs. 4. Domestically, we must give higher priority to teaching history and other social studies. For Americans to so misread the Revolutionary War and the Declaration of Independence as to accept that secession can be undertaken just when people feel like it, thereby legitimizing not just breakaways in distant Georgia, but maybe even within this country, is frightening. The ethnic and religious fragmentations in today's world are buttressed by such ignorance. "A knowledge of the past prepares us for the crisis of the present and the challenge of the future," John Kennedy once wrote. We will do more to ensure America's future with a true, honest, and appreciative understanding of our history and the principles that underlay our Revolution, Declaration of Independence, and Constitution than we will by enhancing science education, important though that is. Ignorant citizens are ill-prepared to make wise judgments when they go to the voting booth. An understanding of our own history will be a positive lens through which to view world events. End of this far-flung lunchtime rant. *Ann Althouse, a professor of Constitutional Law, recently wrote about this here. ...the Southerners...believe in "states' rights." They think any state should have the right to pull out of the Union, and that it is tyranny to keep them in against their wishes. They say they are doing the same thing George Washington and the other revolutionaries did against King George: fighting for their freedom. But it is a white freedom they are fighting for, and the North won't let them do it. Revolution is only right, says President Lincoln, "for morally justified cause." The South has no just cause. So, said Lincoln, secession is "simply a wicked exercise of political power." Not all revolutions or secessionist movements should be wrapped in red, white, and blue bunting. Speculation that Senator Joe Biden of Delaware will be Senator Barack Obama's choice for vice presidential running mate is heating up. For several reasons, Biden is a sensible choice. He fills several of the bottom line needs Obama has from his number two. Maybe. First, Biden is a mature, experienced office holder. He can play Lyndon Johnson to Obama's JFK. Second, Biden may be seen by many general election voters, by virtue of his long service on and chairmanship of the Senate Foreign Relations Committee, the reassuring national security presence that potential Obama voters concerned by the Illinois senator's seeming lack of an overall foreign policy, national security vision. But Biden does not fit the bill for the third critical quality Obama needs in a running mate. He isn't from the South. I still think that former Georgia Senator and one-time Senate Armed Services Committee chair Sam Nunn is Obama's best choice for a running mate, the one who can help him the most, especially in the Peach State, which may prove critical this November. A major downside to Biden is that his version of the Straight Talk Express, while usually refreshing, can sometimes get him into trouble, as happened earlier this year when his characterization of Obama as "articulate" was seen as condescending and racist. It Really is 'Amazing' Grace: God "can chisel His image on our flawed lives and make us beautiful and useful"
Every day I'm amazed by the fact that God forgives a sorry old sinner like me. I pray that in some way, He can be seen through the fog of my imperfection and He'll get all the glory! Ben Stein, droll Renaissance man, said in a recent piece in the New York Times that he doesn't like paying taxes. But the lawyer, actor, and one-time speech writer for two presidents (Richard Nixon and Gerald Ford) is unimpressed with the supply side economics of the two most recent two-term GOP presidents, Ronald Reagan and George W. Bush. He's also unimpressed that presumptive Republican nominee John McCain intends to continue supply side policies if elected president in November, stating that at a time when revenues are stagnant, deficits and indebtedness to foreign lenders are exploding, and government is growing, he will not allow tax increases during his tenure. Some increases in spending are essential, Stein believes, especially in rebuilding the US military. The sad truth of the last two two-term Republican presidents is that their economic premise, the key part of their economic game plan, simply has not done what it’s supposed to do. That is, cutting taxes, especially on upper-income Americans, does not generate so much economic activity that it replaces all the lost I.R.S. take and then some. At least those have been the results so far. When Ronald Reagan lowered taxes, personal income tax revenue stagnated from 1982 to 1984. Now, you may say that revenue rose sharply after that. So maybe that was a mixed result. But when President Bush drastically cut taxes after he was first elected, the I.R.S. take from individual income taxes fell and did not recover its 2001 level until 2006.A conservative purist might rejoin here that it would be fine if income tax receipts fell, because we would then have a smaller government and a freer society. That would be nice, but far from true. Instead, government just keeps growing. Government spending grew dramatically under President Reagan, very nearly doubling, and leaving us with a federal deficit vastly bigger than the one he inherited. I know that a large chunk of that increase was to rebuild the military. I heartily approved of it. But if you want to have a military buildup — and we need one now, desperately — that’s usually a reason to raise taxes, not cut them. Under the current president, we have had the same story. As income tax receipts fell, military and other spending rose rapidly. Again, this spending was justified as far as I’m concerned. But we have been left with immense deficits and a doubled national debt as President Bush enters his final months in office. Mr. McCain wants to extend many of President Bush’s income tax cuts and to reduce taxes on corporations. But the facts of life are that we have a large budget deficit, even though some other nations have even larger deficits as percentages of gross domestic product. We have to pay interest on it. As a people and a nation, we owe this money in large part to foreigners — and that can have political implications. The facts of life are that federal spending is almost all untouchable: the military, Social Security, Medicare, interest on the debt, pensions. The discretionary part is tiny. What's intriguing about Stein's critique of McCain's stated intention of making the Bush2 tax cuts permanent and to not raise taxes during his watch is that Ben Stein, the son of one time chair of the Council of Economic Advisers under President Nixon, Herb Stein, is a conservative Republican. It isn't just in the realm of foreign policy that the neo-orthodoxies of postmodern conservatism are questioned by traditional conservative thinking. That can't bode well for John McCain as he strives to knit a new Republican coalition this year. Worthy to Ask God for Help? A young woman visited me in the office of my first parish. She wasn't a member of the congregation. But I knew her to be a kind-hearted person. She was then in her twenties, but back during her teens, her mother had died and a grandmother took her in. She had been close to her entire family, but when an uncle sexually abused her and she felt that she could confide in no one, her life grew worse and worse. Feeling isolated and hopeless, she became promiscuous, then got involved first with alcohol and then hard drugs. After we talked, she checked herself into a hospital and then a treatment program. The counselors and other patients urged her to rely on her “higher power.” For her that could only mean the God we meet in Jesus Christ. That created an early snag in her treatment regimen: She couldn’t believe that God would care about her, be interested in her, or help her. She felt far from God. I visited her several times at the treatment facility. Along with family and friends, I urged her to read Scripture and to pray, talking with God just as she would with a good friend, and to be unafraid to ask God for help. Over time, that young woman gained the strength not only to deal with her addictions, but also to face life. The last time I saw her was many years ago. But the last I heard of her, she was still doing well. And her real progress seemed to begin when she vetoed worrying about her own worthiness and asked God for help. In my twenty-four years as a pastor, I’ve met many people who wanted to have God’s help and guidance, but felt, like that young woman, that they didn’t dare turn to God. They didn’t feel they were good enough or important enough to care for them. But is that true? Do we have to meet some test of worthiness before God will hear our prayers? The fact is that none of us is worthy of God’s help. But God wants to help us anyway. We see this truth in today’s Gospel lesson. In it, Jesus passes through the non-Jewish region around the cities of Tyre and Sidon. The people who live there aren’t the targets of Jesus’ earthly mission. After He is crucified and risen, just before He ascends to heaven, Jesus will tell His Church—including you and me--to go into the whole world with the Good News that all who believe in Him will have forgiveness of sin and everlasting life. But during His earthly life, Jesus came to fulfill the Old Testament prophecy of a Messiah Who came to call God’s own people, the Jews, to follow God into His kingdom. And yet, for one of only two times in His life, we encounter Jesus as He chooses to travel outside His native country. He probably did this because the opposition against Him is increasing and in God’s plan, it isn’t yet time for His crucifixion. But if any of Jesus’ disciples thought that Jesus could travel anonymously through this country north of theirs, they soon had another think coming. A Canaanite woman shouts at Jesus. The Canaanites, you’ll remember, were bitter enemies of God and of God’s people. Yet this woman cries out to Jesus for help. How did she come to think that she was worthy to cry out to Jesus for help? What made her think that the Messiah of an enemy people would free her daughter from imprisonment to a demon? The answer to those questions couldn’t have been because she was ritually clean, as the Pharisees insisted good people must be. She wasn’t a Jew. She didn’t abide by Jewish ritual law. I bet she didn’t even know what a Kyrie, a Hymn of Praise, or a creed were. It appears to me though, that there were three things that she did know, three things that you and I need to know when dealing with daily life. First: She knew who Jesus was. That’s clear from what she called Jesus. “Have mercy on me, Lord,” she says, “Son of David.” Son of David was the title associated with the long-promised Savior, Messiah: the King of all kings. Who knows how the woman had come to know this? Probably reports had come from Judea about Jesus. On hearing them, she may have resolved that even if there was a one-in-a-million chance that she would ever meet Jesus, if she did, she would go to Him and beg Him to help her daughter. She believed that Jesus was the Messiah and because He was the Messiah, she also believed that He could help. One of the most important questions that Jesus asked during His earthly ministry was, “Who do you say that I am?” This is an important question for you and I to answer: Who do we say that Jesus is? It's a question that we must answer for ourselves. We can't rely on the faith of our parents or children. Who is Jesus for you? Is he some distant deity you either fear or forget or both? Or is He, as this woman knew, the Messiah Who came to show mercy and give life to all with faith in Him, even minute faith that just dares to trust Jesus? The woman knew who Jesus was. Second, this woman knew that she didn’t deserve Jesus’ help. She would agree with Paul, when he makes an honest confession for the whole human race: “All have sinned and fall short of the glory of God.” The Canaanite woman doesn’t say, “Lord, take away the demon because I’m a good person.” She doesn’t say, “Lord, help my daughter; she’s such a good girl.” She knew that nobody deserves the help of God. And so, she says simply to Jesus, “Have mercy on me, Lord.” She bases her request not on what she deserves, but solely on the infinite love and mercy that God bears for all people! So, this woman knew who Jesus was and she knew that she didn’t deserve Jesus’ help. She knew a third thing: She knew that Jesus cared. Of course, you and I have the advantage on those who encountered Jesus during His earthly life. We live on this side of His crucifixion and resurrection. Through His cross, we know the depths of His passion for us. Through His resurrection, we know that He has power over our worst enemies: sin and death. Jesus' care for us has been written in His sacrificed flesh and blood and in His resilient love that will not die! But it’s amazing that the Canaanite woman knew how much Jesus cared, because not even His disciples appreciated this. When the woman first approached Jesus, He paused. I think He did this in order to test the disciples. If so, they failed the test miserably. They didn’t urge Jesus to help this desperate woman as Jesus had helped Him just a few days before when they thought they would drown at sea. Instead, they begged Him to send her away. “Her shouting is really annoying!” they tell Jesus. The disciples remind me of the "good" members of some "good" churches. They want their churches to grow so long as the people who start coming look and act just like them, as long as they don't bring any problems to church with them. That would make life easier, of course. But is it faithful for Christians to send people away who annoy us? A buddy of mine started a congregation in the Tri-County area of Cincinnati. Early on in the life of the congregation, they began attracting all sorts of dysfunctional people who felt the need for Christ in their lives. They brought all their problems and often, their noisy conflicts with them. One day, a couple got into a fierce fight on the church parking lot and the police were called in. At that point, the leadership of my friend's church had to make a choice: Did they want to take the easy way, asking only "good" church people to be part of their fellowship? Or, did they want to take the harder route, inviting dysfunctional people with all their problems into the church? They took the harder route, regularly employing off-duty policemen to be on hand for worship and today, thousands of people gather with that congregation every weekend. In those days, Jesus’ fellow Jews referred to non-Jews as wild dogs. Here, poking fun at His own people’s exclusionary ways, Jesus uses the word kunarion, a term used for dogs kept as house pets. On the way to granting this woman’s request, Jesus speaks to her tongue-in-cheek. The woman seems to pick up on Jesus' humor and His intent immediately. 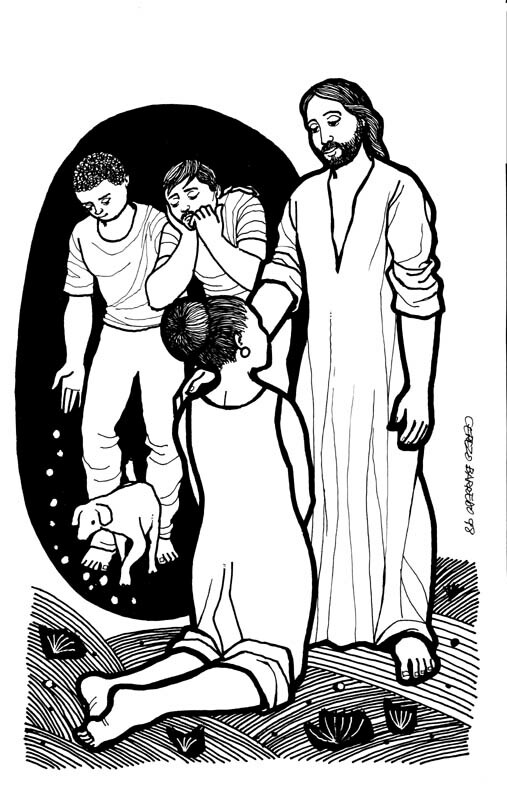 She would never dream of taking anything from the children of Israel, she tells Jesus, “yet even the house pets eat the crumbs that fall from their masters’ table.” Jesus, she knew, cared about everyone, including her. At this, Jesus lays aside the banter and declares, “Woman, great is your faith! Let it be done for you as you wish!” He saw in her faith that He had never observed even in His closest followers. Matthew tells us, “her daughter was healed instantly.” She knew that Jesus cared. Because of what this woman knew, it seems never to have crossed her mind to be quiet when the disciples became annoyed with her or when Jesus initially met her request with silence. She understood that no one is so far from God to be beyond God’s heart. I hope that whenever you’re tempted to feel that God doesn’t care about you, you’ll remember that too. The people in a farming community were frightened that if rain didn’t come soon, an extended summer drought would kill their thirsty crops. The local pastors called for an hour of prayer on the town square one Saturday. They asked everyone bring a single object of faith for inspiration as they prayed. At noon, the townspeople showed up to ask God’s help. The pastors saw that people had come with a variety of objects which they “clutched in prayerful hands ... holy books, crosses, rosaries.” At the end of the hour, as if on cue, a gentle rain began to fall. “Cheers swept the crowd as they held their treasured objects high in gratitude and praise. From the middle of the crowd one faith symbol seemed to overshadow all the others: A small nine-year old child had brought an umbrella.” That boy was as confident of God’s mercy as the Canaanite woman was on the day she met God in person in Jesus. If you and I know first of all, Who Jesus is and if we, secondly, know that through Jesus, God cares, then we also know thirdly, that in spite of the fact that we don’t deserve God’s help, God is always willing to provide it anyway. Whatever you face in the coming week, I hope that you’ll remember those three truths.